As a follow up to my first motorcycle road trip, I thought about a "what worked and what didn't" type post. I used everything I brought with the exception of first-aid and spare parts. Camping gear: Most of the camping gear that I brought was pretty much tried and true stuff that I have been using for a while so no real issues with any of it. The MSR multi-fuel stove isn't quite as convenient as my older MSR G/K version as it lacks the built in flint lighter but it packs much smaller. I think I will pick up a smaller fuel bottle for moto-camping trips as there is a readily available fuel source. It may be time to retire my 35 year old Camp 7 down sleeping bag or maybe I could try washing it again. 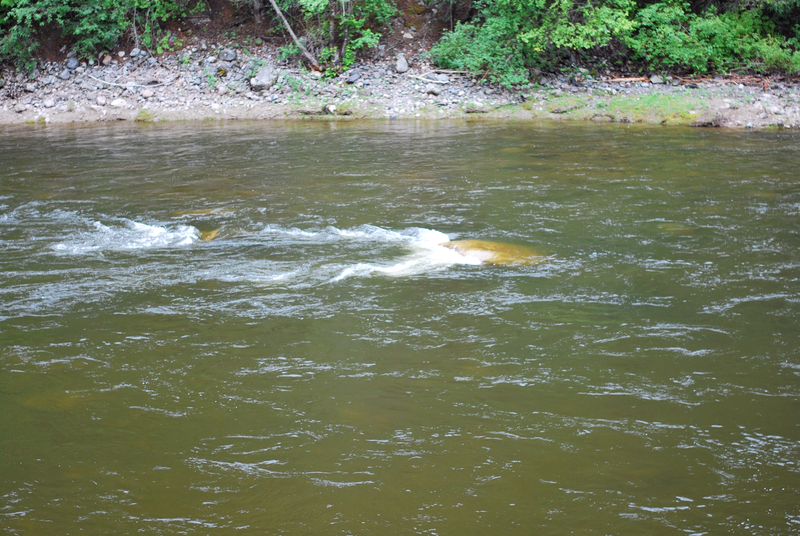 The down was clumping leaving cold spots. I had one nice, stainless steel tent stake and three aluminum ones. I need to find more stainless steel pegs as the aluminum ones tended to bend. Riding gear: It was a hassle to bring two sets of riding gear but I'm not sure what a better option would be given the broad temperature range. As I mentioned before in an earlier post, the Tourmaster one-piece rain suit was completely waterproof but a real pain to put on or take off since they wouldn't fit over my boots. My boots are just leather work boots so that may be contributing to the problem. Motorcyle specific boots may be better as they wouldn't have the lace hooks or heavy lugged sole which seemed to catch on the inner liner of the rain suit. Since the soles are starting to crack, it may be time to replace them anyway. There is no provision for using a heated liner with the rain suit as there is no path for the power cables through the suit. This was only an issue on the first day when it was cold and rained for most of the day. No complaints at all with the "on sale" mesh gear I had picked up a couple of years ago. The rain over gloves my son and his wife gave me just before leaving worked great. Helmet: I was glad that I had picked up the mirrored visor as it significantly reduced the temperature inside the helmet. The HJC Symax-II helmet is very noisy and ventilation is almost non-existant. Even with earplugs there is a lot of wind noise. And I have the wrong shape head for it as the chin bar touches my chin. It is now five years old and probably will be replaced sometime soon. Tires: I am somewhat disappointed with the life of the Heidenau K60 rear tire as it lasted only about 4K miles. It may have been the air pressure as I was following the BMW recommended pressures. In Oregon, I picked up a Shinko 10 SR 712 and ran it at a much higher pressure. It now has 4K miles and looks like it still has a lot of miles left. The new tire worked great on pavement but add in a little bit of loose stuff and it is horrible. But then again it's not what it was designed for. I will probably pick up another K60 sometime and try running it at higher pressure. Bike: Oil consumption for the entire trip was one cup. I need to replace the rear brake pads due to grease contamination. At certain speeds (not normally encountered in Alaska) there is a slight wobble in the steering. Four times during the trip, there was a weird vibration from the engine, kind of like it was missing. 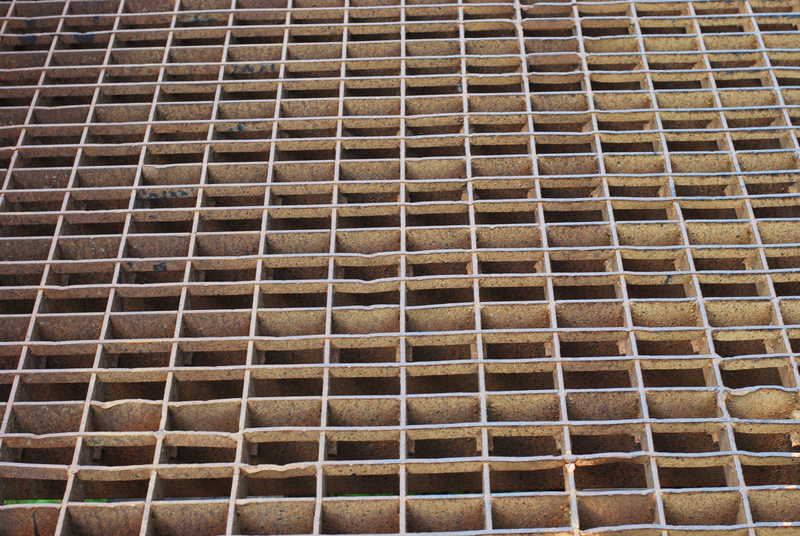 This has been a recurrent problem over the years but it never lasted long enough to figure out what it was. Some sort of throttle lock would have been nice to have. Overall, the brakes on this 29 year old bike are pretty pathetic and the additional load from luggage didn't help. I think just about everything on the road, including busses and tractor trailer rigs have a shorter stopping distance. Overall gas mileage for the trip was only 40.9 mpg, not very good. A stress crack in one of the plastic luggage cases from a latch rivet developed in the middle of the trip. Maybe I was overstuffing them. One of the two rear shocks couldn't be adjusted for preload and it looks like it's leaking oil. Electronic Gadgets: This was one of the rare times when I went on a trip without a laptop. Just an iPad. It was only an issue one time when I needed to download a log file from a linux server in Barrow and send it via email. I ended up using remote-connect software on the iPad to connect back to my laptop in my office to get it taken care of. Kind of a hassle. In Washington, I signed up for one month of access to Verizon on the iPad and that generally worked well when I was in the lower 48. It was usually as fast if not faster than the hotel wireless. 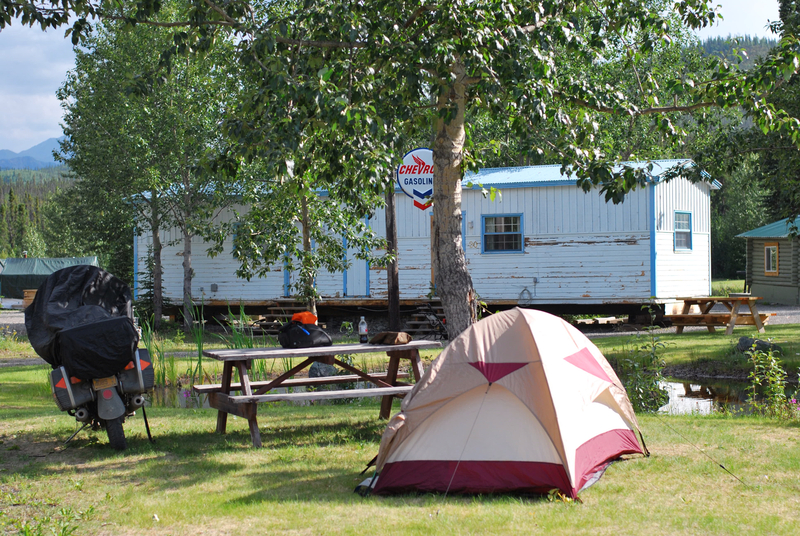 Most, but not all, of the campgrounds and hotels offered wireless Internet access. Hydration pack was useless as I couldn't use it while riding. Garmin 60CSx worked great though sometimes it would lose access to the maps on the micro-SD card. Maybe due to vibration. The Milepost iPad app was completely worthless. Don't bother getting it. You need access to the Internet for the app to even start. I wish there was a way to give it negative stars in the app store. The Blogsy iPad app worked fine for doing blog posts though it was annoying to have to occasionally go in and fix the html. The waterproof iPad case was only used for storage rather than during use. It was too hard to read the screen plus you didn't have access to the dock port for charging or uploading pictures. SPOT was a great addition. I think it added some peace of mind. The lithium AAA batteries lasted about three weeks with tracking turned on for 10 hours per day. The top box was very convenient and a great addition. I ended up using the half cover for the bike every single night even though I was originally planning on using it at hotels. 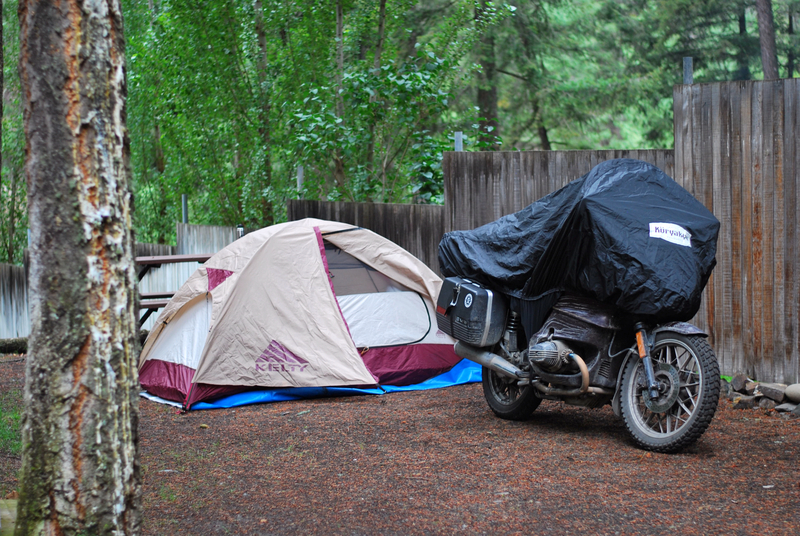 While camping, it was a great place to store the riding gear. I should've brought the 18-55mm zoom instead of the 50mm f1.8 lens. More versatility. Thank you Conchscooter for the reminder. I had a wonderful trip. I thoroughly enjoyed travelling on two wheels. 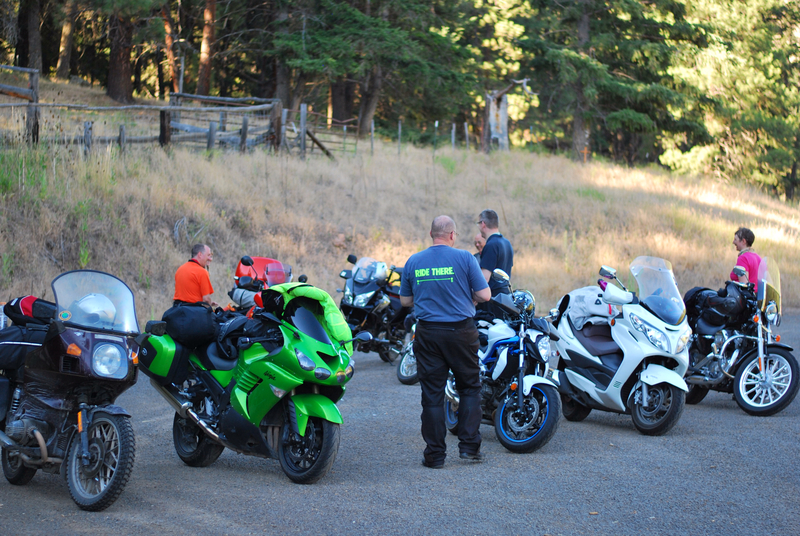 I met wonderful people along the way, and didn't have any real problems with either the bike or other drivers. I must admit that the last part surprised me. I expected more rude or inattentive drivers in some of the more congested areas. Thunder and lightning from about 9:30pm until midnight then steady rain for a couple of hours. The good news is that it it was still nice and dry inside the tent. Since my next stop was home, I just went ahead and packed up my tent, ground cloth and bike cover wet and was on my way by 7:45. I stopped in Beaver Creek for breakfast since I still had a lot of Canadian change to spend. It turned out that I had plenty for breakfast and even a couple of huge peanut butter cookies for the road. It was still cold and damp when leaving Beaver Creek and this is typical of the scenery around the border. No issues crossing the border and I was the only one there i.e. no line. I kept stopping to put on my liner since I felt cold and taking it off since I was hot. I think it was the humidity making it feel colder than it was. 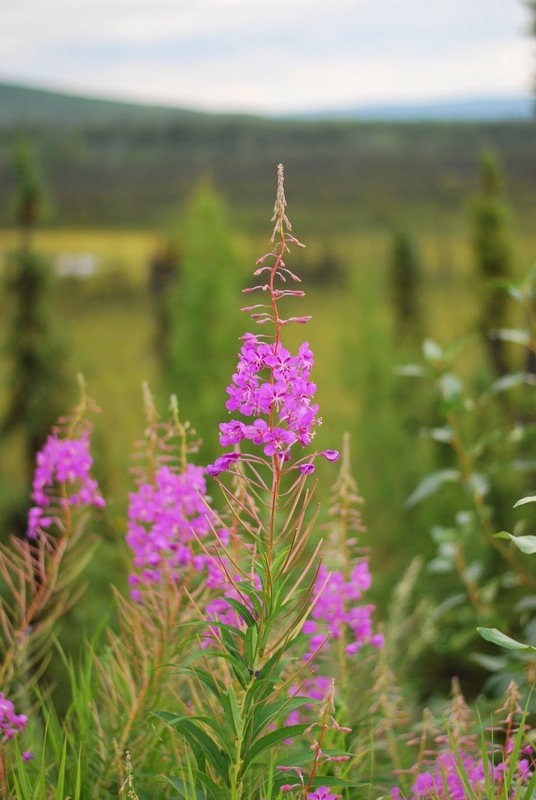 The fireweed seems to be everywhere now and is one of those things that hint at he end of our summer. This is at the same turnoff as the previous picture. By mid-morning it had cleared up and was starting to warm up. 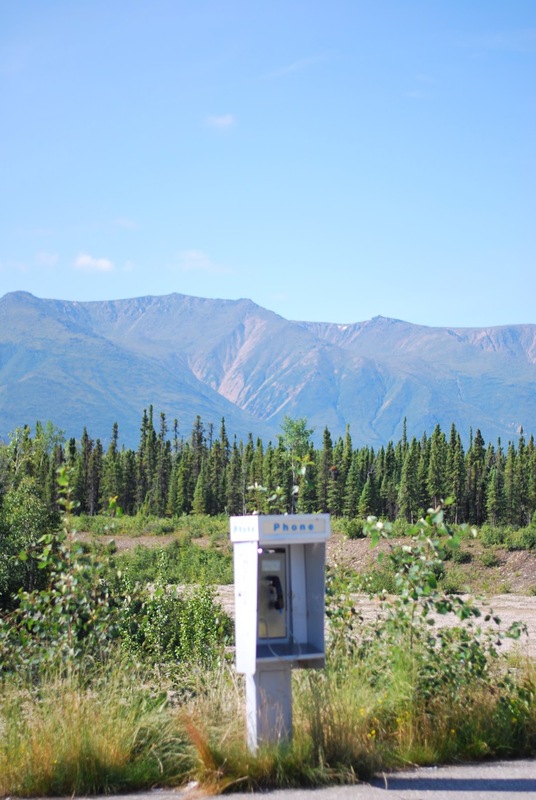 This is a rest stop between Tok and Delta Junction and I was impressed that it actually had a pay phone here in the middle of nowhere. The nearest settlement was probably 20 miles away. I didn't test the phone for functionality. I just stopped for a snack. I was originally planning on having lunch at Fast Eddys in Tok as they have a great salad bar. Fresh greens are something I haven't had since Oregon. Not much selection besides "road food" for the last couple of days. 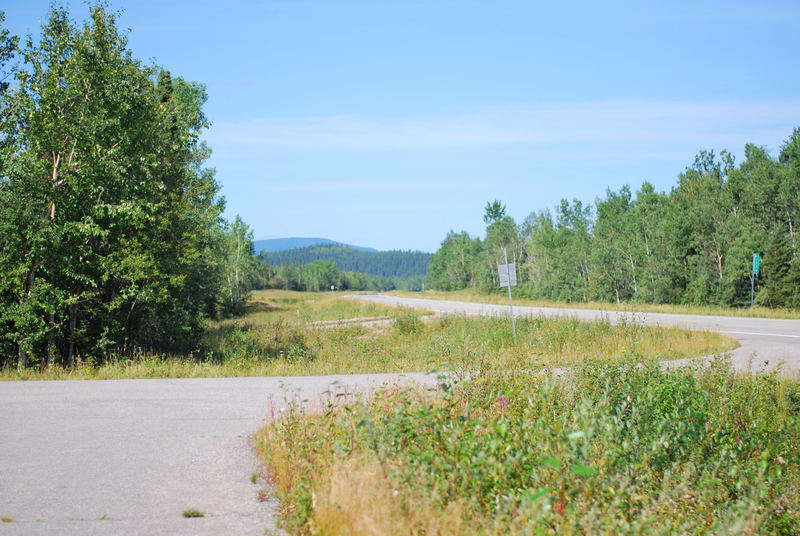 Just one last photo showing the Alaska Highway. Nice and empty, a few curves. Nice cleared areas along the sides to make it easy to spot wildlife. 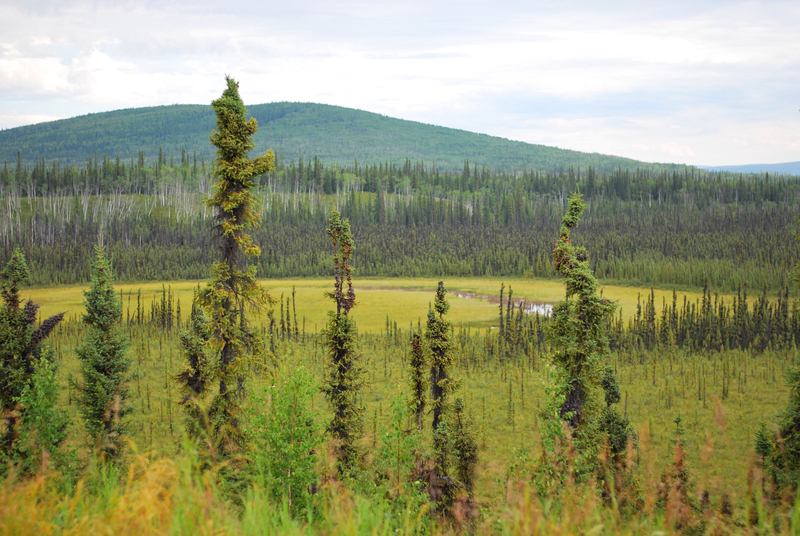 Today, only one black bear near the White River bridge in the Yukon but seven moose, all in Alaska and all sitting ponds near the road. Day 24 - I left the Kitwanga RV park at the crack of 9:00. It's always a bit harder to leave early when camping out. 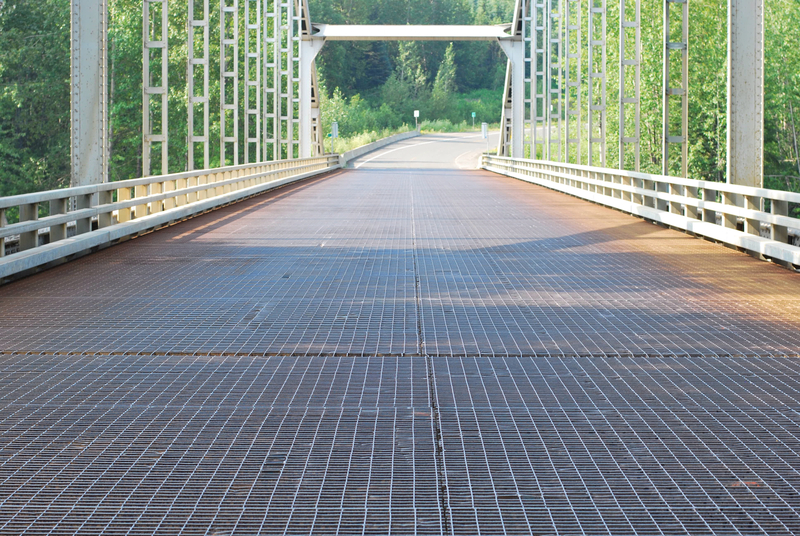 There are four of these metal grate bridges on the first half of the Cassiar and many motorcyclist freak out when riding over them. 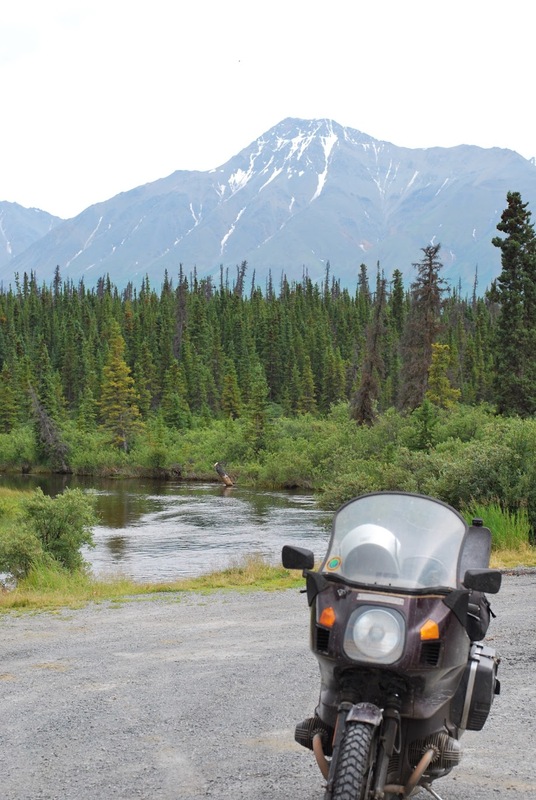 This is just practice for the one over the Teslin River once you get on the Alaska Highway. The key is modest speed and a very light touch on the handlebars as the front wheel will seem like its bouncing all over the place. Just let it and make slight corrections to maintain the right general direction. The Teslin River bridge is much longer and much higher. I have heard of riders refusing to cross and just turn around and head home. Especially when there were quite a few of this style. Now, I think the Teslin bridge is the only one left on the Alaska Highway. 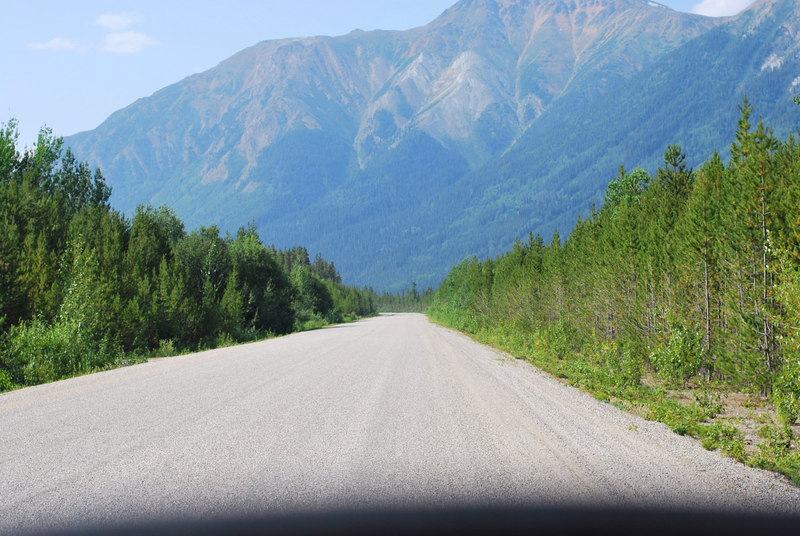 This is a "typical" look of the Cassiar Highway taken from the middle of the road. Since traffic is so light, I just waited for a long stretch when I could see traffic coming in both directions before stopping. There must be a lot of black bear in this area since I saw nine of them and also one sheep. All of the black bear were crossing the road. 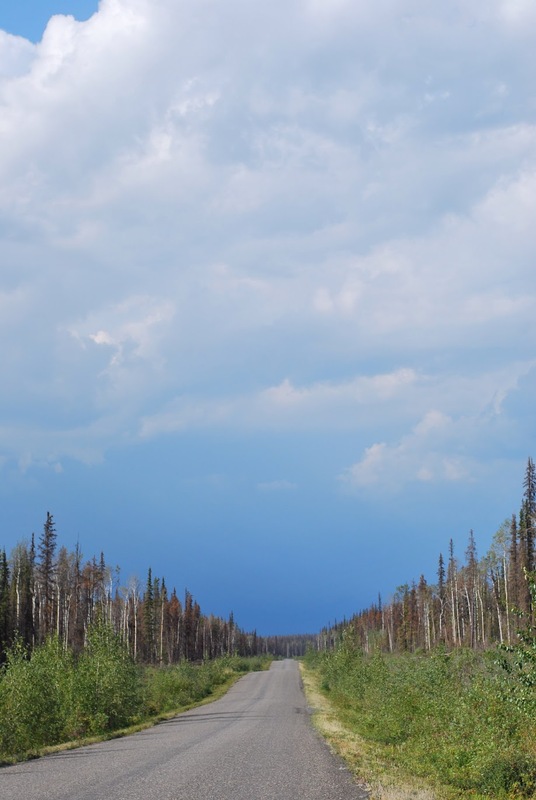 About fifty miles from the junction with the Alaska Highway, this is the weather that I'm headed for and also gives a nice look at typical scenery. It rained pretty hard for the last twenty miles and when I arrived at the Nugget City campground, I opted for a "sleeping room" instead of setting up my tent in the mud. The rooms are probably for construction crews but it was clean and compact. No complaints from me. Another tourist passing through was on a Harley and he and I had dinner at the restaurant. The wi-fi here was $10/hr so I passed. Day 25 - I left Nugget City at 7:30 AM and it was still raining. After about an hour, it had cleared up so I could dispense with the rain gear. My first stop was Teslin for gas and an early lunch. I thought about taking a picture of the bridge but didn't. As I was crossing, another rider was filming with his GoPro as he was crossing from the other direction. This is from a rest stop coming into Haines Junction. I'm told that the haze is from brush fires but they weren't sure where they were. If it was clear, there is a 15000' peak visible through the gap. The Kluane visitors center was closed but I think that they may have moved it somewhere else as it was one of the best on the highway. Right after leaving Haines Junction, the rain started again though these were more like afternoon thunder showers. A lot of wind as you approach the rain, get dumped on, then clearing up once you pass. I passed up the campground at Kluane Lake as it was still early in the afternoon and I knew that there was one further down the road that I wanted to try out. 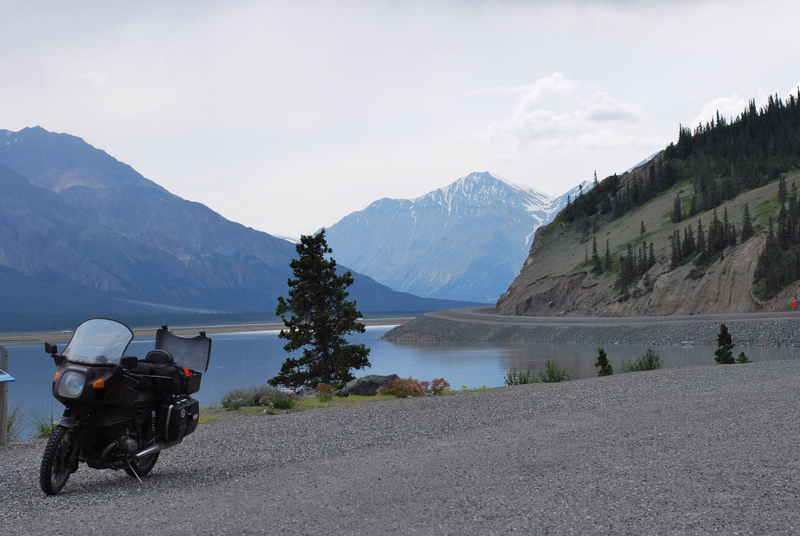 The Kluane Lake area is still one of the most beautiful parts of the trip. The lake is glacier fed so it has a greenish tint to the water. It is much more evident on a clear day. The road has been redone in recent years as the road used to run right along the shore of the lake. Now there are only a couple of places to pull off to get a view of the lake. This one is about a mile northwest of the visitors center. By the time I arrived at he campground at TMoN (The Middle of Nowhere) somewhere between Beaver Creek and Burwash Landing, the rain had cleared. They gave me a wonderful site right next to a little pond. 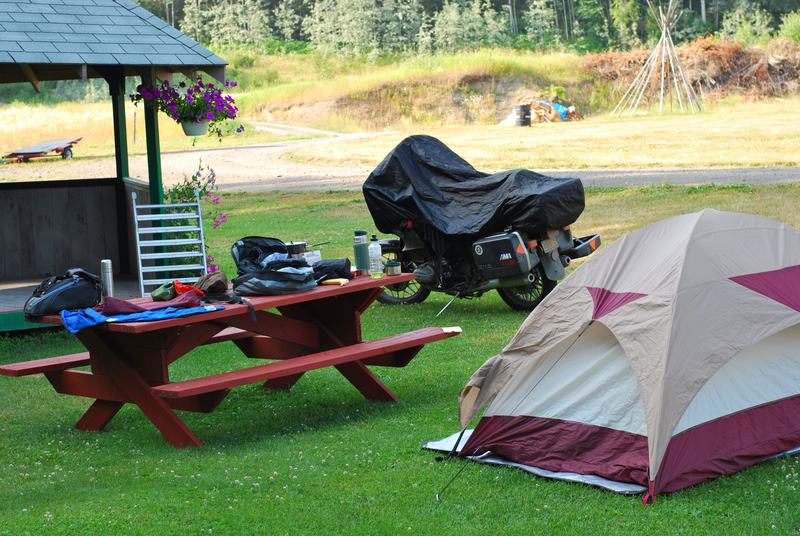 On the other side were two couples on Harley's with two little tent trailers. They said that they weigh about 350lbs empty but with all of there stuff in them, maybe 500lbs. They said that they tow really well and beats sleeping on the ground (gesturing towards my tent). 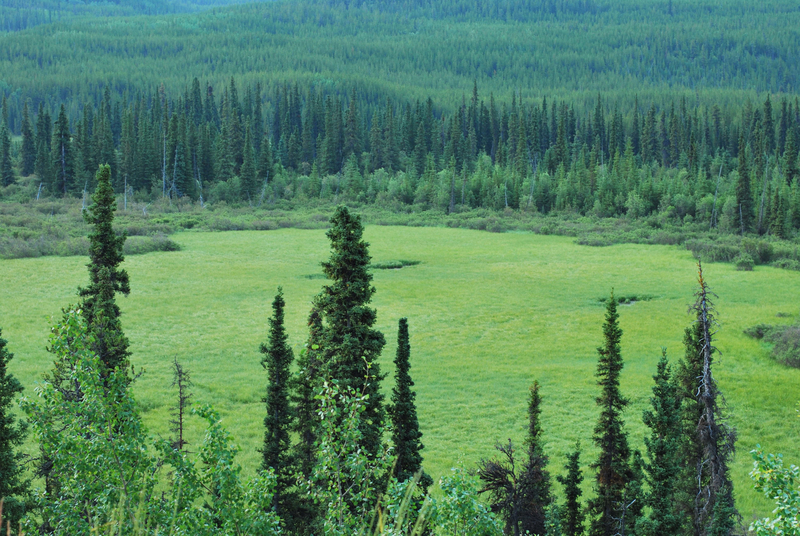 BTW, when I here the word "meadow" this is kind of what I visualize. The sky looked dark grey and foggy this morning in Quesnel but it turned out to be the pulp mill venting towards town. I left by 7:45 hoping to beat the weather.com prediction of rain in Prince George. 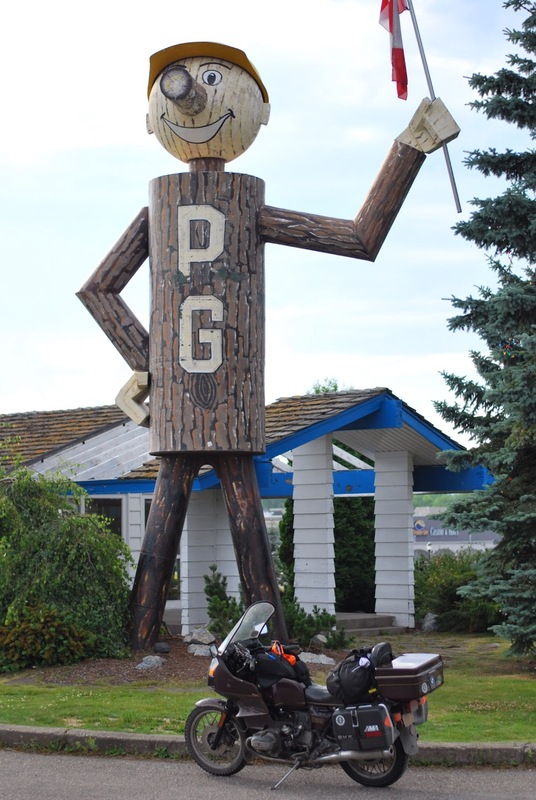 I got there a little after 9:00 and looked for Mr. PG as mentioned in the comments on yesterday's post. It was at the deserted tourist information center at the intersection of 16 & 97. You had to cut through the casino parking lot to get to it. 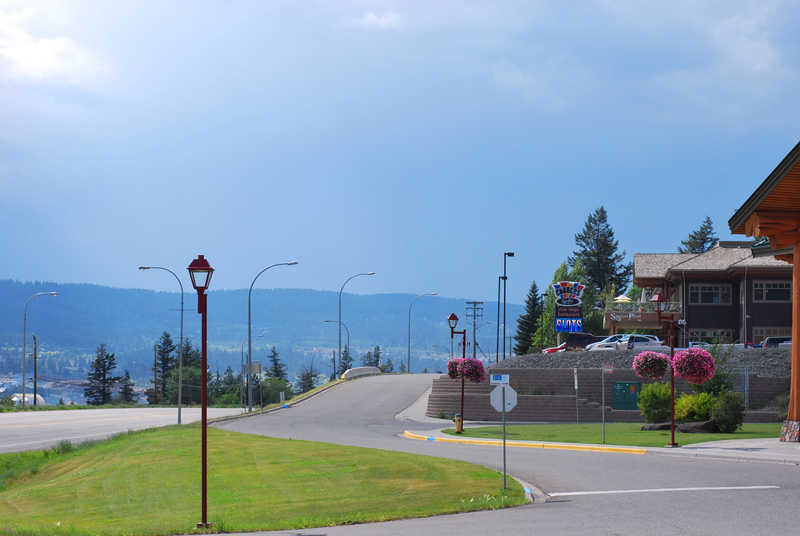 The traffic in Prince George wasn't bad possibly due to the time of day. 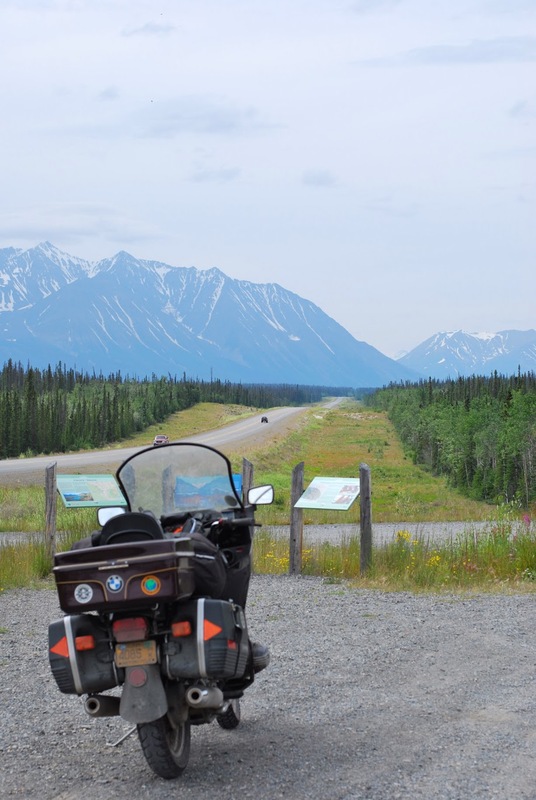 Most of the rest of the day was spent working my way west on 16 towards the southern end of the Cassiar Hwy. Just as on my way down not much at all to photograph. The road just made its way through town after town with farm fields in between. After Smithers, the traffic lightened up considerably and it was feeling pretty warm. Due to the dreary sky and cool temperatures in Quesnel, I had switched back from the mesh riding gear. By 2:00, I switched back and will probably continue to use the mesh gear for a while. 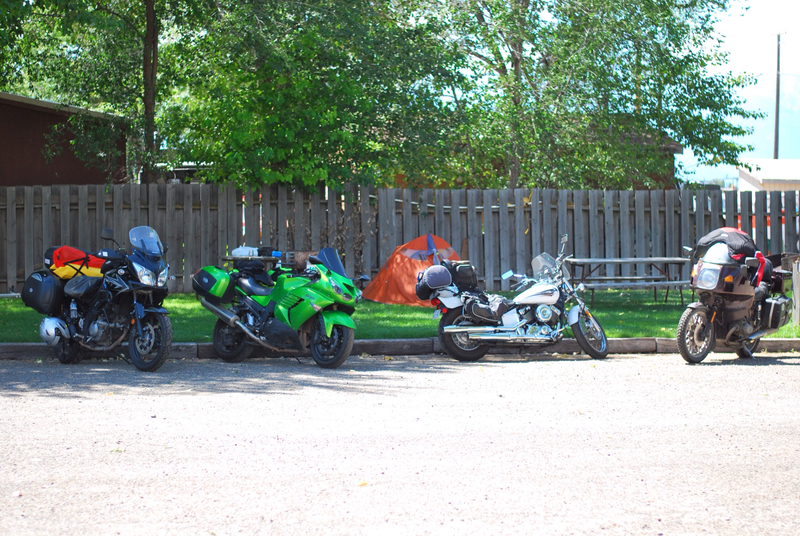 I stopped at the visitors center in New Hazelton for some free coffee and took the opportunity to get another bike picture. The sky was cloud-free but hazy. Not very appealing. I am staying at the same campground I stopped at on the way down. Very comfortable, clean and quiet. And decent wi-fi. Cooked a simple dinner of whole wheat pasta, marinara and frozen cauliflower and carrots. Delicious. There wasn't a cloud in the sky this morning so the tent was very bright and warm by 8:00. It took about an hour to pack since I needed to let some stuff dry up before packing. 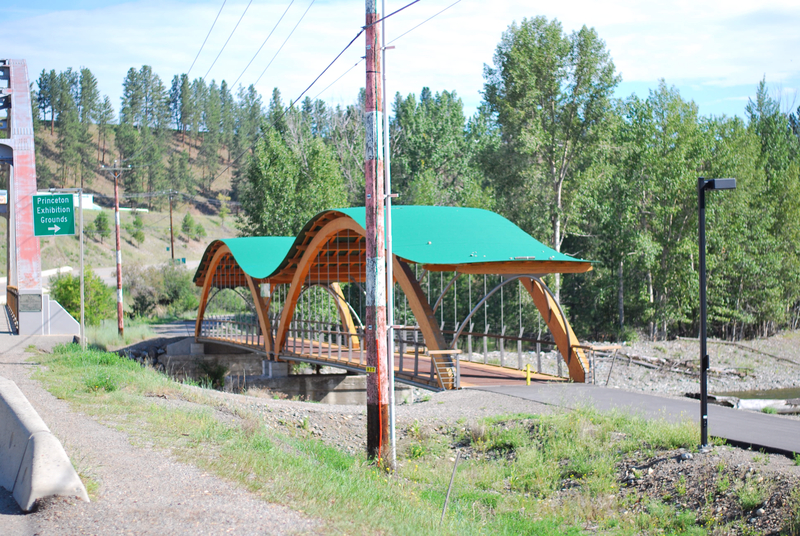 I passed this foot bridge in Princeston on the way down and thought it looked pretty cool but didn't stop to take a picture. Due to the camber of the road I couldn't get the side stand down so I just took the photo while seated on the bike. The first couple of hours were on wonderful mountain roads but once I hit 97N, things got less interesting fast. I just followed the GPS directions and ended up hitting 97N in Spences Bridge instead of Cache Creek. All day, the roads got more and more crowded as I approach Prince George. Though still much better than California traffic. 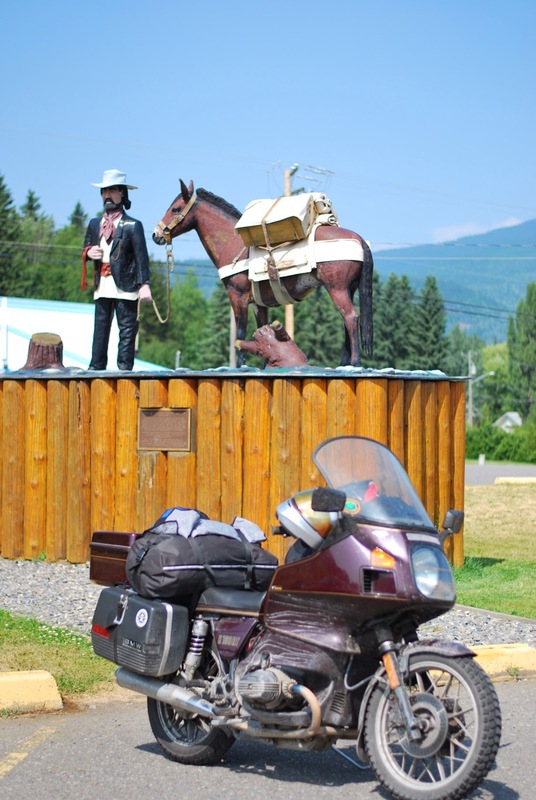 The bike hit 70K miles today in Williams Lake just as I was approaching the visitors center. So, naturally, I had to stop and document it and celebrate the event with a cup of coffee. 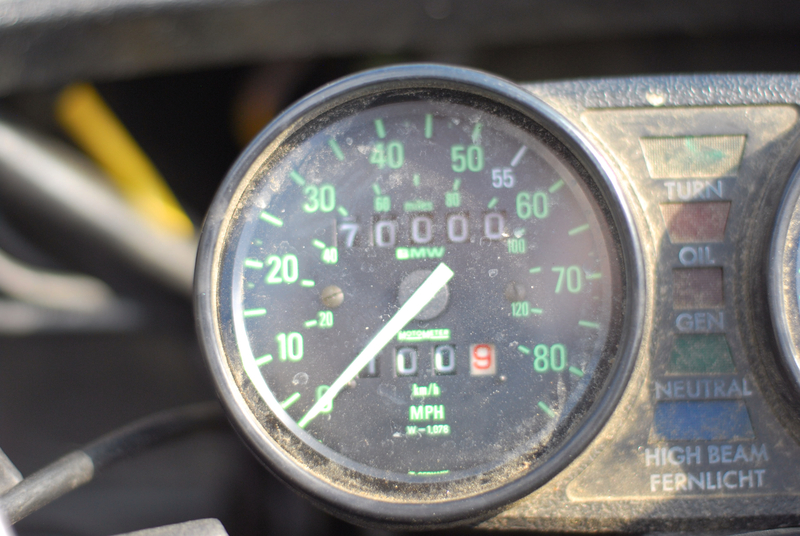 The bike had 52K miles when I bought it so I haven't put very many miles on it myself. And it looks like it really needs a thorough cleaning. Simply relying on rain is proving to be a bit inadequate. 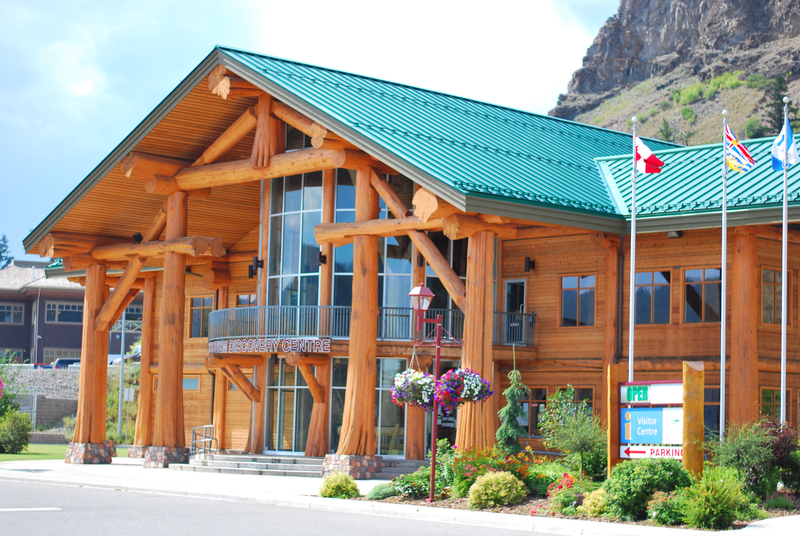 This is the visitors center in Williams Lake. The last time I was here a few weeks ago, it was closed for the evening. It is a beautiful facility and I must admit that I love the look of log buildings but would never own one due to the maintenance. Dark skies to the north gave a not too subtle hint to the weather I would hit later in the afternoon. No thunder or lightning but plenty of intermittent showers. Enough to stop and don rain gear. A short day today since I find rain and hot to be a tiring combination. According to the GPS, 571km today and 8,637km (5,367 miles) so far on this trip. 2,679 km to go according to the all-knowing Google. I left Joseph around 7:15 this morning and it was cold enough to dig out the Gerbings. Initially I didn't plug it in but about 50 miles further, it was worth a stop. I think that it was in the mid 40's (°F) when I left Joseph and it was colder in the mountains. 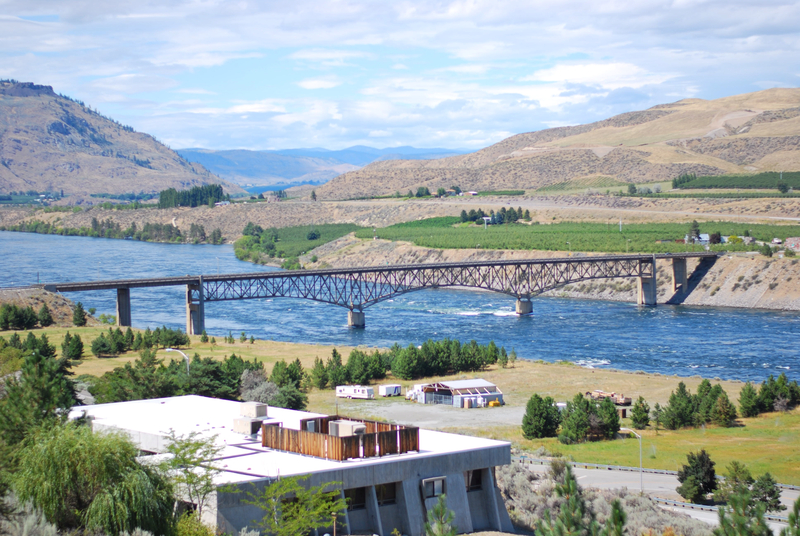 I stopped at Moses Lake for some lunch before heading for the border crossing at Osoyoos, the same crossing I had used two weeks ago. Central Washington wasn't at all like it was earlier with moderate temperatures and scattered clouds. I stopped at the Chief Joseph Dam in central Washington to rehydrate a bit. This is the view down river from the same power plant viewpoint. I didn'teven know that is was here. 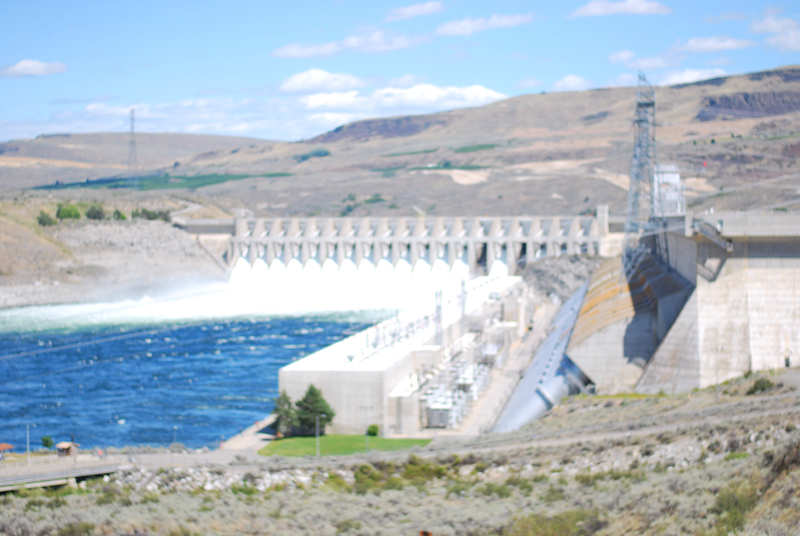 All I ever heard about was Grand Coulee dam in school. By now, the temperature was in the mid-80's but still scattered clouds. As I headed north, the sky got darker and darker. I just made the border crossing with about ten minutes to spare and within minutes aft crossing the border, it started to rain. I am camping just north of Hedley, BC, in a nice RV park. I thought about looking for a motel but decided that camping would be fine. It looked like the rain was done for the day. If it wasn't wet and dark, I would've kept on going as I didn't feel tired at all. There is a nice river running just behind the campground so hopefully it'll drown out the noise from the adjacent campground. Some really noisy folks right on the other side of the fence. A bit over 700km today. A good start. 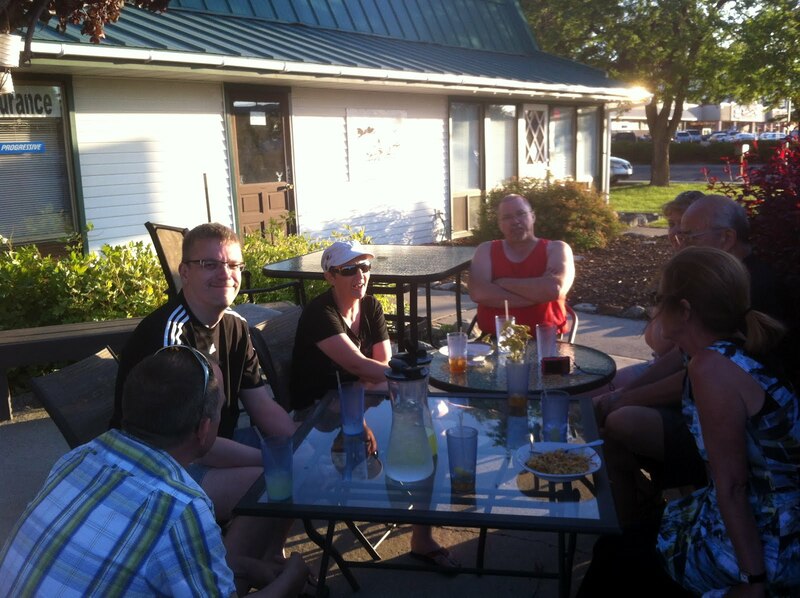 Today ended up being a rest day in Joseph, OR. All of us had long riding days coming up so we explored the town of Joseph and visited under the trees at the hotel in Joseph. It was a beautiful, cloud-free day at least until late afternoon when we heard some thunder in the distance. 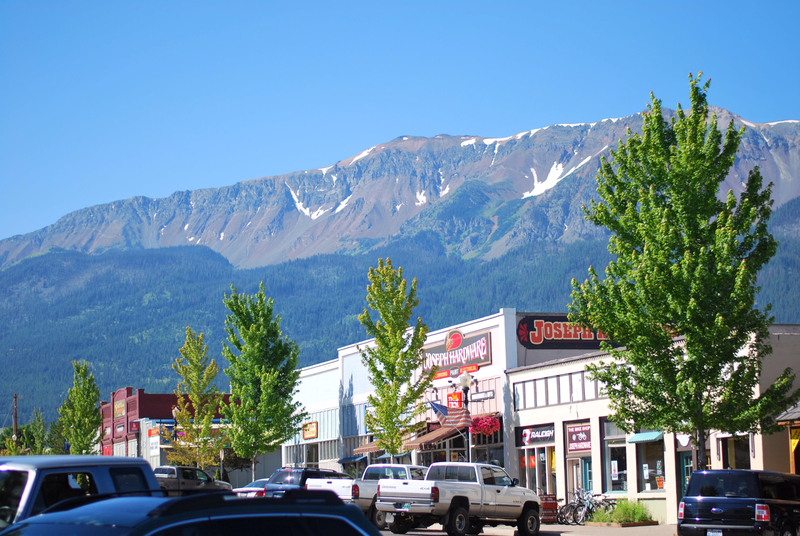 Joseph turned out to be a wonderful quiet town with a lot of interesting shops to explore on Main St. with a surprising variety of restaurants. 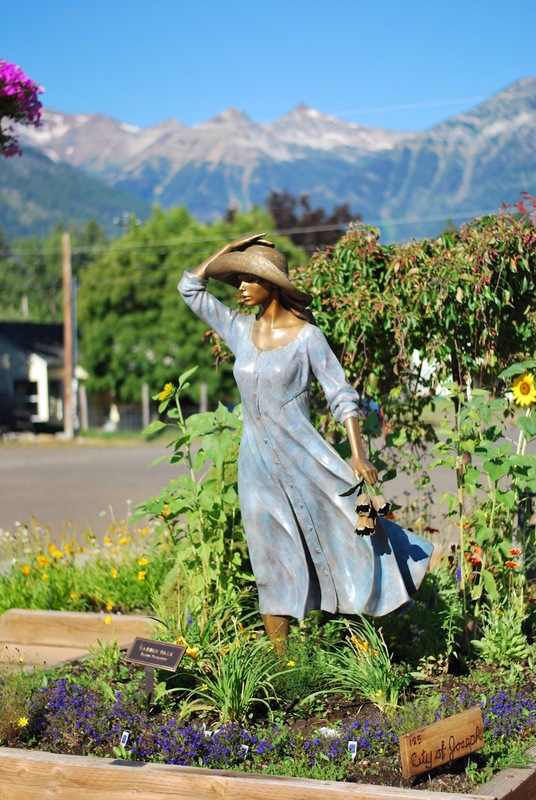 Most of the corners were decorated with planters and these wonderful bronze statues. I'm not sure why but there was a bronze gallery in town so maybe there was a local artist doing the work. It was a small town and I think that tourism may be the dominant industry though there are a number of ranches surrounding the town. 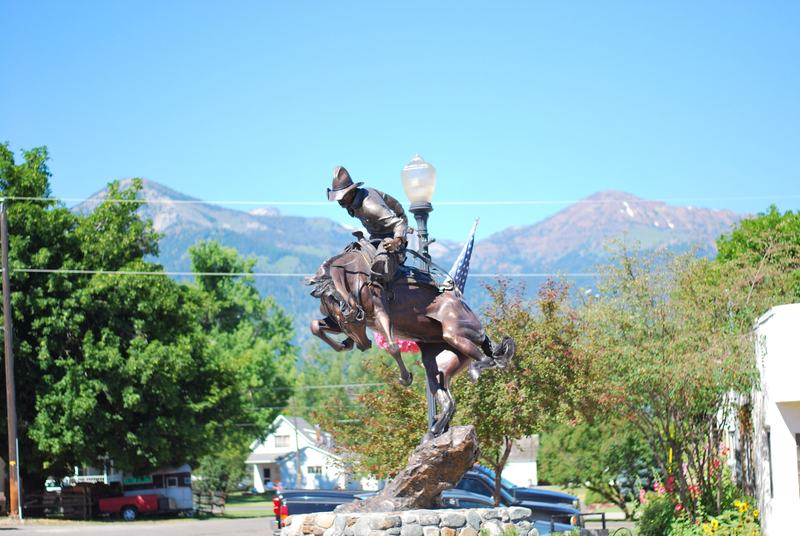 Another one of the bronze figures, I think that this one was in front of the post office. The mountains surrounding the town were beautiful and yesterday again demonstrated that Oregon has the best motorcycle roads. The others came by the hotel around noon and after talking for hours, we looked for dinner. No one wanted to ride anywhere but fortunately Joseph was small enough to walk just about anywhere. By 8:30, the others staying in Enterprise headed out before dark and we said our good-byes. I'd say that iMBC2012 was a success and I'm glad that the others were willing to fit it to my travel schedule. Bright, sunny and hot is a good description of the weather. 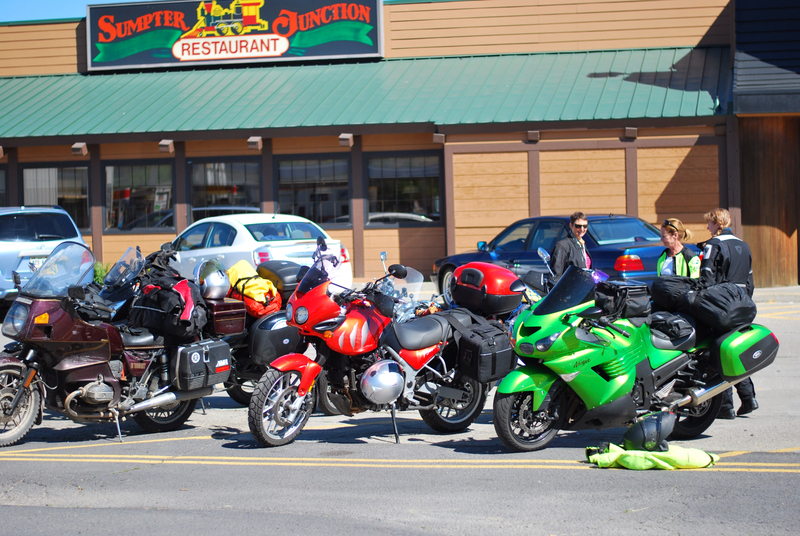 The plan for today was after breakfast, we would head for Hell's Canyon east of Baker City. This is a shot at he restaurant right after breakfast. 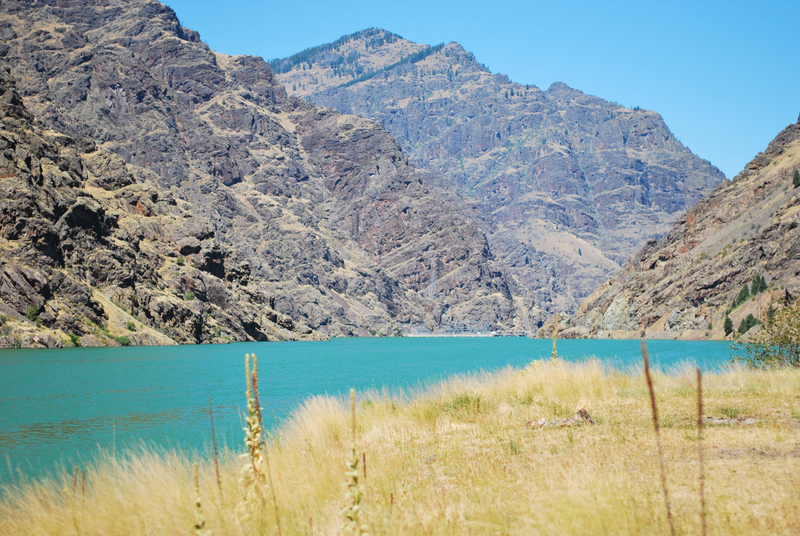 After some topped up on gas in Halfway, OR, we headed for the Hell's Canyon Dam. I went with some trepidation as I have never really rode in the mountains before this trip and there were promises of some very windy roads. This is the reservoir behind the dam and you can just see the top of the dam in the center of the frame. The road to the dam was pretty twisty but with no real elevation gain or loss. And it's actually in Idaho not Oregon. I rode out to just the base of the dam before turning around and heading back to get gas and a cold drink at Oxbow, OR, at a small store catering to the boaters on he lake. I think that this is the road that some call "the Devil's Tail." The sky was completely clear all day and the thermometer at te store indicated 100°F though it was probably reading a little high. After a short break to get rehydrated, the fun began. 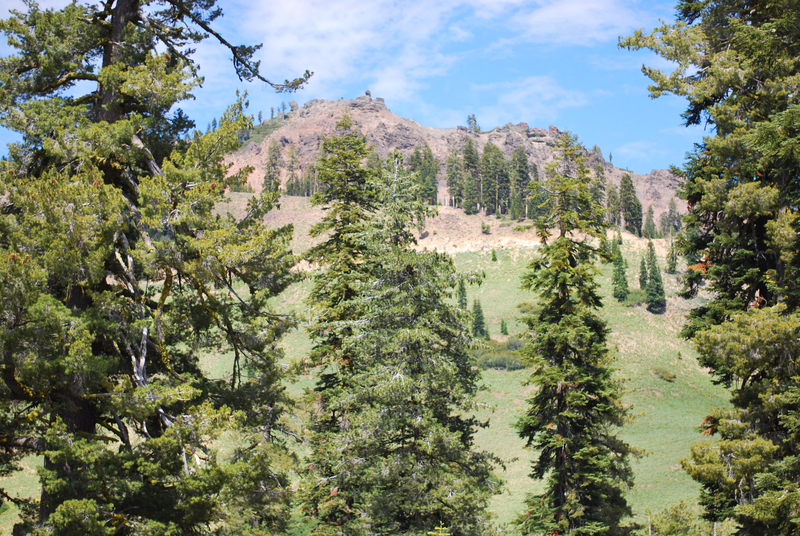 We backtracked a bit and turned on NF-39 heading towards Joseph, OR. This was a narrow forest road with lots of curves, switchbacks and steep cliffs. Not as difficult as I had heard but I scraped my right foot peg five times today. Quite a shock to me the first time it happened but I learned to tip my toes down a bit in the corners as my boots will touch the pavement a fraction af a second before the foot pegs. We arrived in Joseph late afternoon. This was at our last regrouping stop of he day. A nice shady spot at the intersection of NF-39 and the road to Joseph eight miles away. 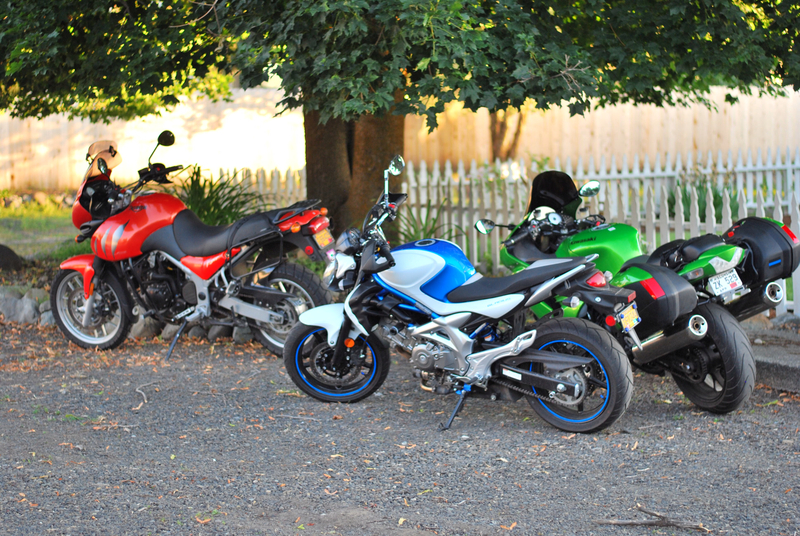 Quite a mixture of brands and styles of bikes in this group. A more eclectic mix may be hard to find. I had a great time riding today and you would be hard pressed to find a better group to ride with. Thank you Brad, Erik, Brandy, Roland, Sonja, Karen and Bob. This morning after a really deluxe free breakfast at the hotel (potatoes, eggs, sausage), I headed over to the campground where Bobskoot and VStarLady camped out. It was actually a very nice campsite with lots of grass and nice shade. At about 11:00 we heard from Erik and got ready to meet him at his hotel. We had lunch at a diner with a decent salad bar. After lunch, we headed back to the campsite where we sat around getting to know each other. I had only met Bobskoot before a couple of years ago in Bend and had only started following the other two recently. 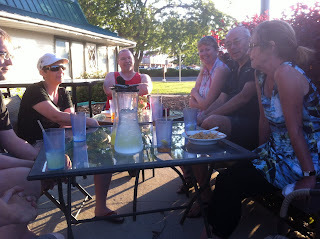 Erik is in the red tank top, then VStarLady, the Bobskoot on the right. It was a very pleasant afternoon. About 4:00, we heard from SonjaM and Roland that they had arrived in town and had just checked into the hotel. Around 5:20, I headed over to the hotel to check in and saw Troubadour and Trobairitz looking out the window probably wondering who was messing with their bikes. After cleaning up, we walked down the road about ½ miles for dinner at a wonderful "bowl" restaurant followed by some coffee. I had a spicy Thai vegetables with pork over brown rice. Very tasty. Starting from the left in the photo, Troubadour, Roland, SonjaM, Erik, Trobairitz, Bobskoot and VStarLady. Another shot from a slightly different angle showing the others. This really is international as the Canadians outnumber the Americans. SonjaM had wonderful embroidered patches made to commemorate the event. When I opened the door this morning I didn't really expect rain. This was the first rain I've run into since leaving Alaska. But that's why I brought rain gear. So far, the Tourmaster one piece rain suit is the only item that I'm not very satisfied with. It does a great job keeping me dry but is a pain to put on or take off. The zippers on the pant legs are too short so I have to remove my boots first. If its raining, that's a real pain. It only actually rained for a hundred miles or so and it was pretty spotty. This was at a rest stop when I stopped to remove the rain gear. As you can see, it is wide open and not much traffic at all. 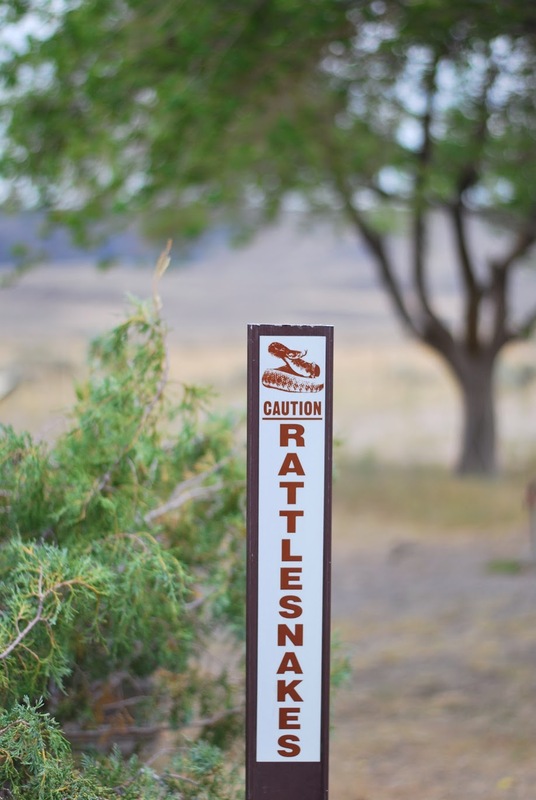 I did see over a dozen of rattlesnakes on the road in both California and Oregon. Many were smashed but some were still working their way across the road. For those that like to pull over and run around without boots, you may want to rethink that strategy. This was a sign at the same rest area but there were signs at the other stops I made along the way. Not much of an incentive to pull over and stop at any random pullout. Another shot from along the road. This was a "rain gear on" stop. This is a pretty boring section of highway. There are some beautiful dry lakes (they currently have water in them) along the road but no handy turnouts to take pictures. When there is a turnout, I didn't like the view. You'll just have to ride the road and see them for yourself. 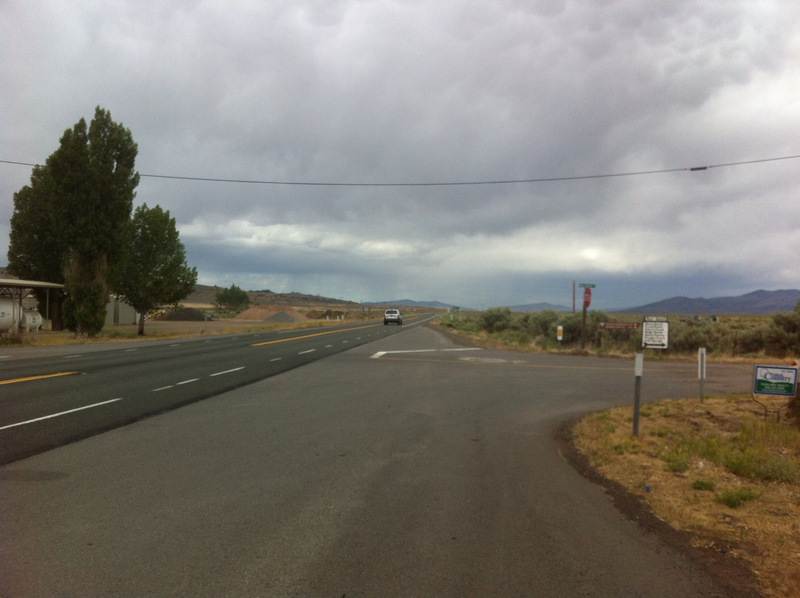 My itinerary indicated a stop in Burns, OR, but since it was still mid-afternoon, I continued up to John Day. No cheap motel so I continued on. 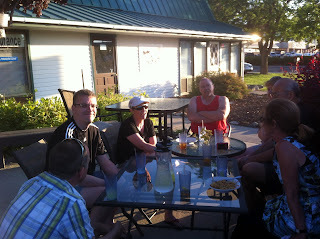 I arrived in Baker City, OR, the starting location for the blogger meet up grandly referred to as IMBC2012, one day early. I was hot and tired and looked for a cheap hotel. There were two others here early as well, Bobskoot and VstarLady. We met at a local pizza place for dinner and the Greek salad I had was excellent. No pictures from me as Bobskoot was taking pictures like there was no tomorrow. Plus, I was hungry. 447 miles (719 km) today and 4343 miles (6989 km) so far on this trip. By 10:30am on Tuesday, the family reunion has wrapped up and folks were starting to leave for home. I set the gps for my cousin's home in Chico, CA and hoped it didn't lead me through really heavy traffic. I did go through the bay area on 17-880-680 and had to pay a $5 bridge toll to get away from the city and traffic was heavy but running pretty fast. I was soon hwy 99 heading north and it was starting to feel relaxing again. 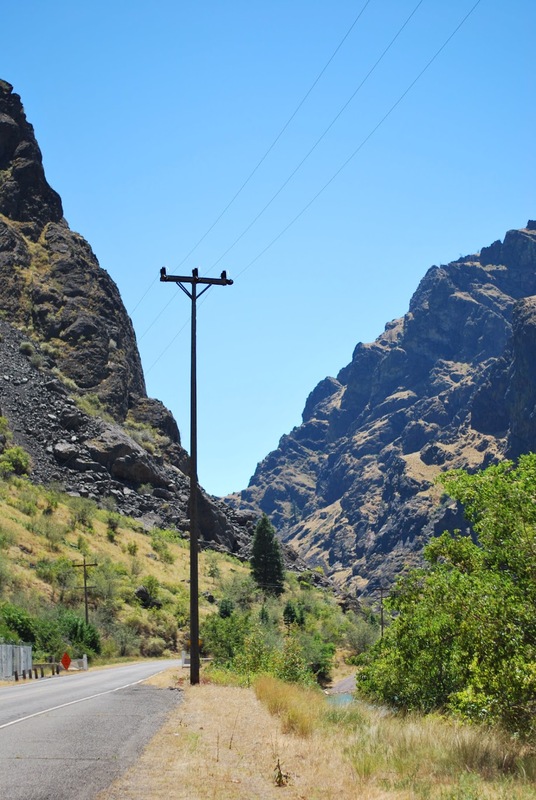 Once I was in Chico, the GPS led me down some small road, which became a smaller road until I ended up on this one lane path winding its way up a mountain. Path is generous as it was closer to a trail. Once I got to the top of the mountain, the GPS told me to turn around and head down the same road I had just come up. Instead, I went around the mountain back to the initial small road. What I had missed was a turn that was missing on the GPS instructions. I only found it due to the "recalculating" message on the screen. I didn't end up leaving Chico until almost noon as I was having such an enjoyable time visiting my cousins. Their home is in a canyon and cell service was all but nonexistent so no opportunity to check out Google Maps before leaving. 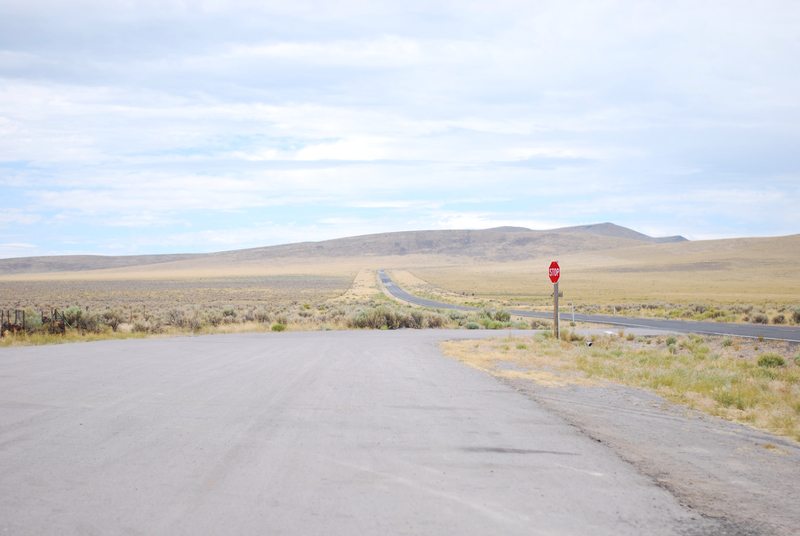 I headed north on Hwy-99 without consulting a map and just knew that I was headed roughly for eastern Oregon. 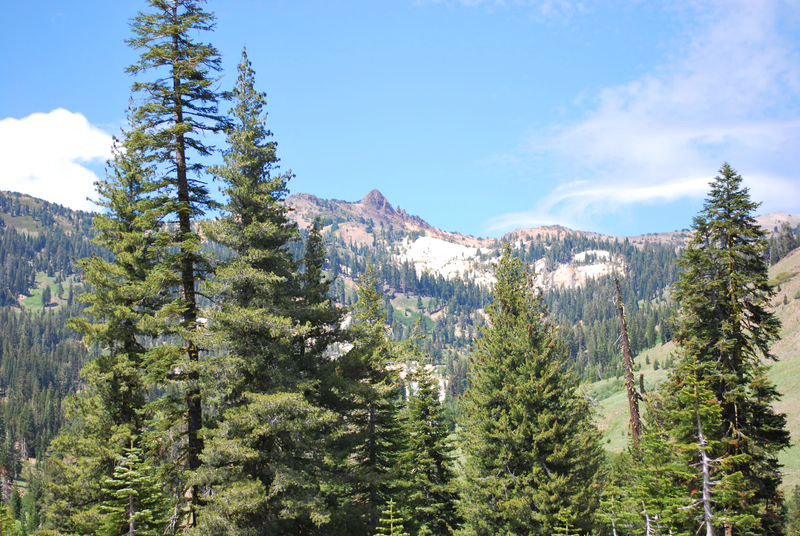 I saw a sign for Lassen Volcanic National Park and it was in the right general direction and it seemed like it may be a great place to stop. The road climbed to almost 6000' and it was wonderfully cool and not very crowded at all. This picture and the next were from the patio on the backside of the visitors center where I enjoyed a light lunch of cherries and water. When I was a kid, we came here to camp and hike. I have fond memories of the park and probably would have camped again if I had all my gear. 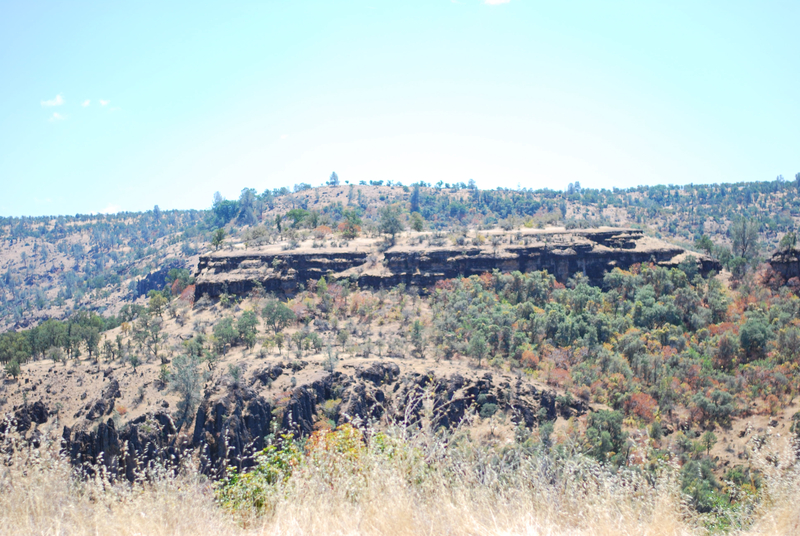 I didn't ride through the park around the mountain as that would've put me back almost to where I started today near Chico. The view and the movie in the visitors center were well worth the $5 motorcycle admittance fee to the park. After leaving the park, I came across a sign pointing to Chico. I added about 75 miles to my day. Tonight, I found a cheap motel in Susanville, CA, with wi-fi and an A/C. Dinner was a couple of lengua tacos from the hole-in-the-wall next door. Delicious! Update - From the southern Oregon fires mentioned in the comments, I looked up their location on the Northwest Interagency Coordination Center, and I won't be traveling near any of them. I'll be going up US-395 through Lakeview and Burns and John Day before heading east on OR-26. There is a fire just south of Okanogan in Washington state. This is where I stayed a little over a week ago.